style, cost, materials, construction methods, workmanship and hand picked special design features such as storage, in-drawer spice racks, glass-in cabinet doors, unique angled wood cuts, built-ins, etc. This requires personal involvement and time by both the owner and the cabinetmaker. Cabinets are built throughout the home, kitchen, bathroom, garage, bedrooms, etc. We walk past them every day, and we use them, lean on them, sit on them; however, we never take into account the significance of them. Your reason for remodeling your home is subject to your preferences. The one commonality for home improvements is to raise the value of your home with the most positive amount of return on your investment. So, when choosing the right cabinets for your home, you should make certain your cabinets meet your budget, space and desired return on investment. Custom cabinets are ideal for this reason and provide 100% customization abilities. Custom crafted and hand-finished cabinets are lasting qualities that far surpass those of stock cabinets. Stock cabinets carry a stigma lower quality craftsmanship, wood grade and a general difficulty in assembly. Just like any investment, the return on investment will be a direct result of the quality put in to your cabinetry. With custom cabinets, personal preferences may also be available, such as a wine cooler, sink space, sliding doors, or other creative elements. Another deciding factor is the craftsmanship of the home. If you have a smaller home or one that turns and twists with unusual spaces, your options are very limited with stock cabinets. Whereas, stock cabinets are built to predictable dimensions, custom cabinets can be built to accommodate the size and style of your home. By region, kitchen remodels have a high return on investment, ranking at least in the top three. However, kitchen remodels will find some of the highest returns for the homeowner’s investment. 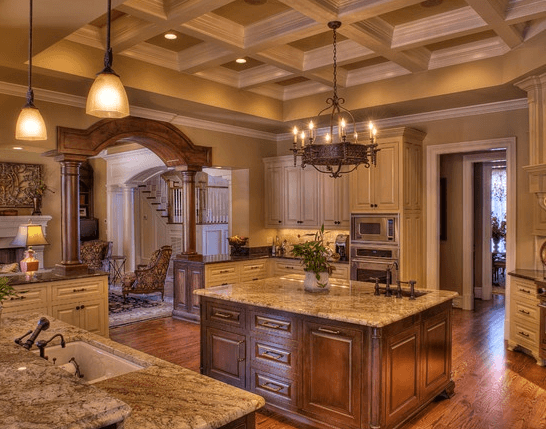 Now is a great time to make a move for a custom remodel. As a homebuyer, you are able to capitalize on the current economic state, while also helping stimulate the local economy! History has shown that great wealth can be achieved in real estate during a down economy. Also, a majority of the time when you add custom features, the home appraises for more than your total investment – giving you equity in it from the beginning. Interior Concepts likes to make the building experience comfortable, personal and fun! Important decisions should not be rushed. Beauty comes from a true collaboration of minds. Starting with the design phase, we take our time with clients guiding them through each step of the process to make certain you understand and are comfortable with decisions before proceeding to the next phase. You will get top quality materials, the finest craftsmanship, and a perfect fit for your unique space. Not only are custom cabinets competitive, installation costs are quite often lower and quality much nicer for your particular space. As an Interior Concept customer, you are involved in every step. From the initial design through installation, we work to make your vision come true.